1. In small bowl, whisk garlic, barbeque sauce and 1/2 cup water. In 5- to 6-quart slow cooker, add pork; pour barbeque sauce mixture over pork. Cover and cook on high 4 hours or low 8 hours or until pork is very tender. With 2 forks, shred pork in slow cooker. 2.Preheat oven to 400°. In medium bowl, toss carrots, jalapeño, corn, oil, salt and pepper to combine; spread in single layer on rimmed baking pan. Roast vegetables 25 minutes or until golden brown and tender. 3.In small bowl, stir yogurt, mustard and honey until combined. 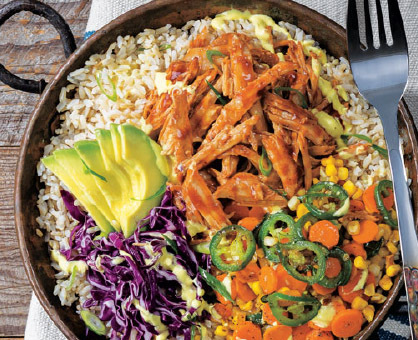 4.Divide rice into 4 bowls; top with onions, avocado, cabbage, pork mixture and roasted vegetables, and drizzle with yogurt mixture.